Once as barren as the desert itself, this Las Vegas balcony is now an outdoor retreat. Keeping it simple, we embraced the desert and sky for inspiration. 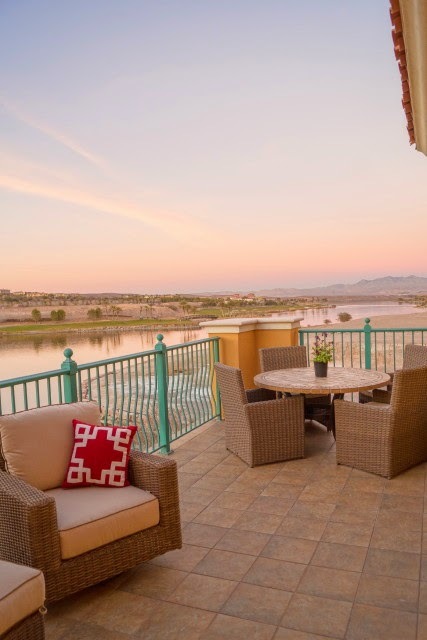 The incredible sunset view is the perfect backdrop that is accentuated with pops of color in throw pillows and railing. Selections of high quality outdoor furnishings by Sunset West are built to withstand any weather. The resin wicker, ensures color fastness and durability. 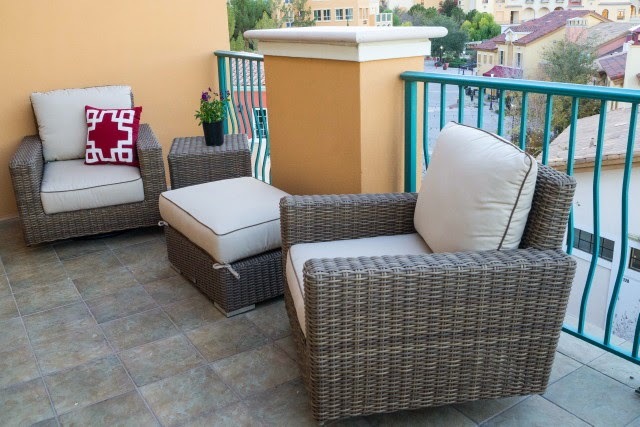 The marble table top adds interest to complete this casual, kick back and relax balcony. The cushions upholstered in Sunbrella is exemplary outdoor performance fabric in a neutral palette with a contrasting edge. It is easy to clean while still being aesthetically pleasing. Put your feet up on coordinating ottoman and rest a drink on the resin wicker side table.